the shape of my self in martial arts posing style during Jeet Kune Do training. balancing 2 meter over the ground on a 15cm large timber. if you got links you can post them here, it would be nice have an collection of this pic used in different places and different ways/styles. Stretch + Strengthen: Want to move with the articulation and finesse of a martial artist? It's a good style, very lethal one. Thanks for the excellent stock! It really captured exactly the image I had for my "stretch and strengthen" class at Jurmaine Health, Melbourne, Australia. For me, the tiny detail that makes this picture amazing are the sneakers. Ordinary and mundane, they ground all that incredible beauty and vigor. And by remaining in near-silhouette you're making a universal statement, as if intentionally illustrating Shakespeare's line, "What a work of art is man." 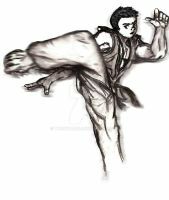 I've been doing Tae Kwon Do for a while, but drawing still holds priority. Thank you, and here you go [link] . Then when looking at dA for more martial art reference, this popped up on the first page... Heh. THis is so cool xD I wish I knew Martial arts but eh tis but a dream XD. Oh I will be submitting the piece when its done Ill be sure to bookmark you so I can link you to it. Cool.I am dreaming of studying some martial arts for years.Not professional, just for me. Featured on [link] in the banner. Thanks man for this amazing photo, and keep it up! You fabulous image has been featured in my journal. Man, that just makes me want to return to karate so bad. Took some Chinese Kenpo in my teens. Loved it. Awesome what style is that? thx, this posing comes from the shaolin, i got friends who are shaolins, i have made with them much poses which are very photogenic, will try to put more poses online soon.